The trips, including one with lobbyist who turned out to be an undercover FBI agent, have been the subject of media scrutiny. 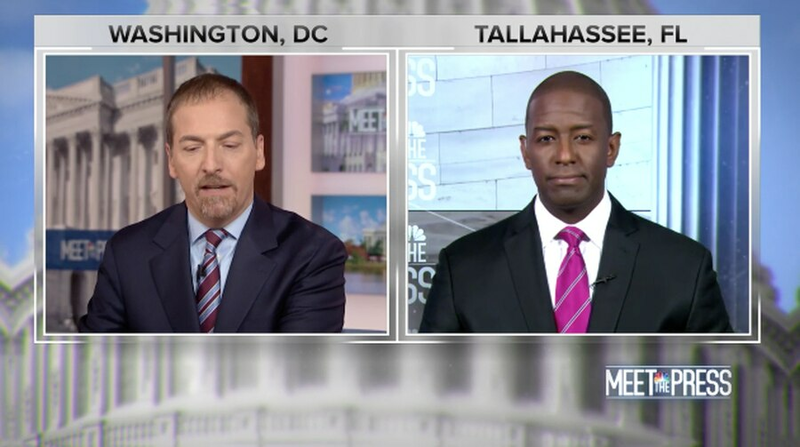 Democratic gubernatorial nominee Andrew Gillum gave three national television interviews Sunday morning. In all three, he fielded questions about the status of the FBI corruption probe into his city government. And on all three programs — CNN's "State of the Union," NBC's "Meet the Press," and MSNBC's "AM Joy," Gillum gave what is becoming a familiar answer to the question: He, as the mayor of Tallahassee, welcomed the investigation, and he's not its target. His Republican opponent, Ron DeSantis, has tried to "undermine" the FBI investigation into President Trump's campaign, Gillum said. Although Gillum had long been friends with the lobbyists, the trip raised the eyebrows of some ethics experts. Gillum, his friends and their significant others reportedly split a $1400-per-night villa on the trip. Gillum says he paid for his portion of the trip, but he has not publicly released any receipts. A separate trip later in 2016 to New York with Corey and the undercover FBI agent, "Mike Miller," also caused some to ask questions. Gillum took a boat trip arranged by Miller, and may have attended a Mets game and a performance of the musical "Hamilton" with Corey and the agent as well. Gillum has said he didn't allow "Miller" to pay for any part of that trip, but the mayor likewise has never provided receipts. Gillum cut ties with Corey, who's at the center of one part of the FBI investigation, last year. "My commitment is to make every receipt available because I've got nothing to hide," Gillum told Todd Sunday morning. "I just wanted to make sure the process worked the way it was intended to." The FBI probe was far from the only topic of discussion in the TV interviews Sunday. Gillum also talked about how he'll implement Medicare for all in Florida, and about racist robocalls that targeted him this week — among other topics.